I recently tore my ACL and fractured my ankle and have been looking for a shoe that has suport yet comfort. These shoes are perfect for that. I feel confident running again on trails with these shoes. I will be purchasing different colors very soon! I woul dsuggest going up a half to full size on these shoes. I am normally a size 7 and went with a size 7.5 and it fits great. I got these shoes specifically for the connectivity so I could use with Zwift on the treadmill. The connectivity is great, much more accurate than the Zwift foot pod, and the shoes are much more comfortable than expected. They do tend to run a bit small, but typical of UA sizing. I wear 1/2 size bigger in UA than other brands & these were no different. Walk or run on marshmallow! Nice bounce that gives energy back! These are by far the most comfortable runningr shoes! IF U LOVE DATA, GET THESE! They do run small. I am an 8 and I could have easily fit a 9. I purchased an 8.5 and they fit but I wish I would have went that extra half up. I run and these can give you amazing stats.. I now know my cadence, stride length, pace, etc. I can customize my workouts more and they do offer you “live” tracking on their MapMyRun app, which comes with coaching, so they are Uber impressive when it comes to anything data related. I would not recommend these for distance running and wish I would have gotten the SONICs instead only because these feel a bit heavy for longer runs. I’ve only done 2-3 mile runs but I do plan on going on longer runs once my feet fully adapt and get used to the extra weight. Now obviously these are not cheap. A part of me wishes I would have gone to a specialty running store and got fitted for a pair of Brooks, or something, which probably would be a bit more comfortable and lighter. However, to my knowledge, they are the only ones on the market which can give you a true in-depth look at your runs.. so it becomes a pretty trade off, in my opinion. Love my phantoms. I have 7 pairs now. The newest being the pink pair. I sized up to make sure it fit. The gals got these cooler looking pink option. My wife loves the shoe! 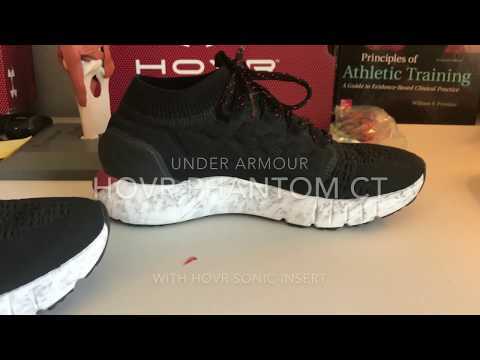 My wife and I were foamers before these HOVR shoes came out, but had to try the UA shoes after all the recent changes on the branding. So keep points are: - After going up a half size, shoe runs big is you choose not to wear an insert, but if you add an insert they will run true to size. - Without an insert, you will feel the outer edge of the sole on your lateral side on foot impact, but an insert removes that issue. - Shoe has perfect amount of response and cushion for serious running. any softer would stress the tarsals and plantar fascia, and harder would make it uncomfortable to run. - I've heard negative comments about the upper ankle part, but the upper is not meant to go sock-less. The purpose is for expansion without a bulky ankle. I wear an ankle sock, no issues.